Many Christians live with a sense of guilt but it doesn't need to be that way. We have all messed up and fallen short. Kindsight informs how we can interpret and accept the past, negotiate and enjoy the present, and remain optimistic for the future. Tania Bright reveals how to develop a habit of loving, forgiving and being kind to ourselves. She teaches us to embrace our failures and fears and see them differently. We are never unredeemable or beyond the love and grace of God. Quite the opposite: He forgives, and He offers kindness. The failures are an opportunity to learn. Tackling a range of subjects more often characterized by pain than kindness - shame, bad relationships, loss, burnout, parenting, and debt - Tania Bright offers a sense of relief to those who live with the nagging sense that they are not up to what God and the world around them would expect. About "Don't Beat Yourself Up"
Tania Bright is Group Executive Director of Enterprise - Chapel Street; Executive Chair of Love146 Europe, and a keynote speaker at many high profile Christian events. She was previously Deputy Director of Research and Development at The Salvation Army. She is a registered foster carer and has adopted two babies with alcohol-related neurological challenges. She regular contributes to Local Authority Adoption and Fostering training and preparation courses, and media such as radio interviews and recently Good Morning Television. 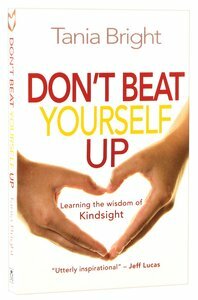 Customer Reviews For "Don't Beat Yourself Up"
I read this book in a time where I needed to build my faith and my self-worth. Through reading Tania's experiences and the way she handled them with God as her strong point really encouraged and uplifted me to do the same and has changed my whole outlook of myself and who I am in Christ. Thank you Tania for your book!